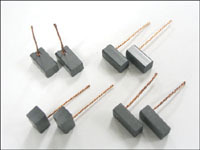 Standardized brush dimensions, maximal tolerances, main dimensions of typical ends for brush lines, lines parameters and their maximal current-carrying ability have been specified in IEC 136 (1986) "Dimensions of brushes and brush-holders for electrical machinery". 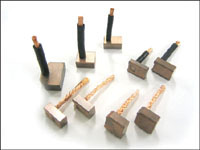 For connections between brush housing and brush holder we use round stranded copper cables, acc. to DIN 46438 with intersections according to IEC 228 norm, and round braided pigtail flex according to catalogue card of manufacturers. 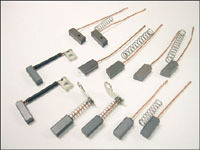 All our products, including carbon brushes are manufactured according to Quality Managing System requirements for construction, production, assembly and service, compliant with DIN EN ISO 9001:2000 norms. This system ensures high quality of our products and maximal customer ' s satisfaction.